If you love to exfoliate your skin, but can't stand the feel of little beads or a scrubbing sponge on your skin, then you should opt for chemical exfoliation. Chemical exfoliation is the removal of dead skin cells and dirt from the outer layer of your skin revealing glowing, beautiful skin. The exfoliating products use ingredients such as AHA's and BHA, and enzymes such as pumpkin, pineapple, and papaya. When it comes to chemical exfoliation, a lot of people think you will get your face burned, but no, chemical exfoliation is rather gentle and a great way to take of the dirty skin cells that leave your face looking blotchy and tired. The number ingredient to look for when you are looking to purchase a chemical exfoliant is Glycolic Acid. Glycolic acid is among one of the best ingredients to use to chemically exfoliate your skin. In today's blog post, I want to highlight a beauty cult favorite; NeoStrata Foaming Glycolic Wash.
NeoStrata's Foaming Glycolic Wash is a powerful yet gentle product that helps to exfoliate the skin's surface, leaving your skin feeling radiant, evened out, and achieving the softness that your skin once had when you were a baby lol. 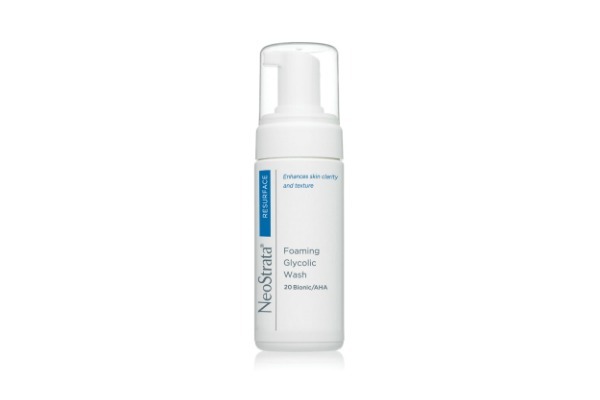 NeoStrata Foaming Glycolic Wash is packed with ingredients that help your skin to get rid of all the buildup from dead skin, dirt, and oil. The two most essential ingredients in the face wash are Glycolic Acid and Lactobionic acid. 1. Glycolic Acid: If used smartly, glycolic acid can be a miracle worker for your skin. Glycolic Acid is part of an active compound known as Alpha Hydroxy Acid. It is derived from sugar canes. Glycolic Acid has the smallest molecule in the AHA's group so it can penetrate deeply into the skin to treat skin problems such as acne, acne scars, fine lines, wrinkles, dullness, etc. Glycolic Acid works fantastic when used in exfoliating products. They help by breaking down and dissolving sebum. Dead skin cells are sloughed off the skin to reveal a smoother, brighter, younger-looking skin. 2. Lactobionic Acid: This is another essential acid that aids in the exfoliation of the skin. Lactobionic acid is also a sugar acid. The Lactobionic Acid will help reverse photoaging, help with hyperpigmentation, and help reduce enlarged pores. Your skin will feel smoother and softer with continual use. Their Foaming Glycolic Wash help exfoliates and smooth skin texture with this potent, pH-balanced, foaming facial cleanser. Ideal for experienced Glycolic Acid users who prefer a deep cleansing, this soap-free face wash contains 18% Glycolic Acid and Lactobionic Acid to help enhance exfoliation. This high strength foaming cleanser is formulated with an amphoteric system designed to deliver the benefits of glycolic acid and the antioxidant Lactobionic Acid while minimizing the potential for irritation. Formulated to gently exfoliate, unclog pores and prepare the skin for optimal benefits of the regimen that follows. Repeated use will leave the skin smoothly textured. As an advocate of skin exfoliating, I find it very Important to add skin exfoliating to your skin care regimen. Apart from sloughing off dead skin cells and revealing of brighter skin, exfoliating your skin of dirt and gunk helps your beauty products penetrate and absorb into the skin properly for optimal benefits. I use the foaming wash twice a day. I use one pump on my skin and massage it in a circular motion for 30secs to a minute; It tends to sting, so for sensitive skin, you might want to wash your face when you start to feel the sting so as not to cause irritation. This post is in collaboration with NeoStrata and Brandbacker, all thoughts and opinions are my own. Good on you for able to use this twice a day! I don't think I could do it because it'll dry the hell out of my skin. lol, Shireen thanks for reading.